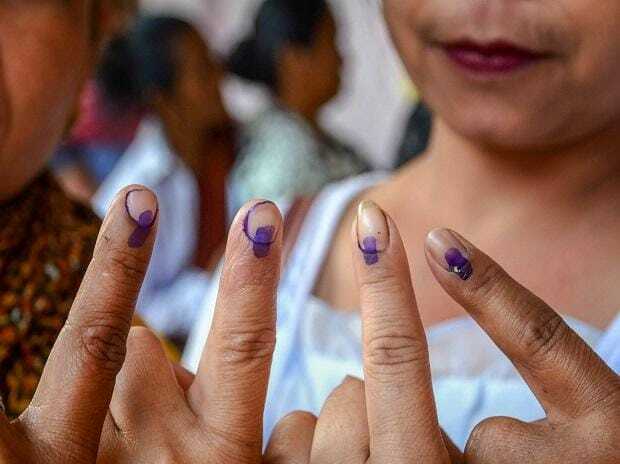 Eight constituencies in Uttar Pradesh -- four general and four reserved -- will go to the polls in the second phase of the 2019 Lok Sabha elections starting April 18. While Nagina, Bulandshahar, Hathras and Agra are reserved constituencies, Amroha, Aligarh, Mathura and Fatehpur Sikri fall in the general category. If someone studies the caste and religious profiles of all these constituencies, it becomes clear that each of them has a very large Hindu population varying from 75 to 88 per cent. The population of Muslims as the second largest religious group in these constituencies varies between 12 per cent and 25 per cent. These constituencies contain around 70 to 80 Hindu castes divided into general, OBC and SC communities. Around 80 per cent of the overall population in these domains lives in rural areas. Some of the reserved constituencies also have big cities such as Agra, Aligarh and Mathura, along with several small kasbas and bazaar towns. Their SC population varies between 20 per cent to 30 per cent. Agra evolved as the centre of the Dalit movement even during colonial times. It was an important Dalit stronghold and affected the politics of Western Uttar Pradesh, Kanpur in the east, and parts of Central UP. Many renaissance movements started and have been deriving strength from the Dalits of Agra since 1915. Agra also emerged as the centre for Dalit publications and newspapers, and was the hub of Dalit political activity during the time of Republican Party of India’s mobilization under the leadership of Buddha Priya Maurya in decade of the 1970s. Swami Achhutanand also got support from Agra's Jatavs, who were working in the leather Industry during First World War. Scheduled castes such as Jatavs, Dhusiya Dhobies, Bhangis, Koris, Kanjars, Bhadakiyas and Haburas have impressive numbers in this region. Among them, the Jatavs, Dhobies and Koris remained the traditional base vote of Bahujan Samaj Party. The OBCs such as Gaderia, Lodh, Yadav, Mallah, Gujar are also in large numbers in these constituencies. Among them, the lodhs, Murao and kurmi, along with a section of MBC communities such as Sonars (goldsmiths), Lohars (blacksmiths), Thathear (coppersmiths) Kasera (brass workers) and Badhayi seem sympathetic towards Bharatiya Janata Party. A section of OBC and MBC castes such as Badhayis (carpenters), Nishad and Mallahs (fishermen and boatmen), Kahars, Yadavs, Gaderiyas, Kumhars (potters) and kahars (watermen) appear as the support base of the Samajwadi party. Jats and Gujars are influential communities in some of these constituencies where people are going to vote on April 18. Jats, the landowners in these regions, dominate the rural areas in some of these constituencies. Their political associations seem divided in the favour of BJP and thegathbandhan, or alliance between Akhilesh Yadav's Samajwadi Party and Mayawati's Bahujan Samaj Party in this election. One may easily observe conflicting situations and contradictions between the Jats and Jatavs in these regions. Some of the Jatavs also own land in these areas, but most work as labourers in the field woned by the Jats and other land owning communities such as Brahmins, Thakurs, Lodhs and Ahirs. Upper-caste voters such as the Brahmin, Thakurs, Kayasthas and Vaisyas may also get divided between BJP and Congress, but the BJP may end up mobilising the majority of them in its favour. In some of these constituencies, Mayawati may face tough task of transferring her Dalit vote base to the SP leaders, because the contradictions in the everyday life of landed communities and landless castes may create hurdles in the smooth collaboration during these elections among various caste who keeps opposite interest. She needs to convince the politically aware SCs residing in some of these constituencies to favour the Bahujan-SP chemistry that may evolve due to the combination of OBC and SC forces. Similarly, the Samajwadi Party needs to convince its support base communities to vote in the favour of BSP. The politics of transference of base votes is very critical and tricky in this region. As we know, the key for winning elections in reserved constituencies rests in the hand of non-Dalits OBCs, MBC and upper castes. This is because the Dalit vote gets fragmented in various part, as candidates of all the contesting parties come from SCs castes. In such a situation, the candidate who gets majority of the votes from the non-SC communities may win the election. In this election, Dalit candidates who are contesting from the gathbandhanhave better chance to get support from various MBC and SC castes. But the BJP and Congress also have a share in the non-Yadav OBC base and many smaller MBC communities. These two parties may also create a dent among a few non-Jatav SC communities. The parliamentary election in these constituencies is going to be very interesting in terms of mobilisation of the castes and communities, and which way the wind blows will only become clear when results are out on May 23.